View south from the East River, with One Manhattan Square (center) and One World Trade Center (right). Superstructure has officially topped out at Extell's One Manhattan Square, a residential condominium tower on the Lower East Side waterfront. Designed by Adamson Associates, the 800-foot-tall tower replaces a former Pathmark grocery store. One Manhattan Square is part of the recent surge of waterfront development in Lower Manhattan. 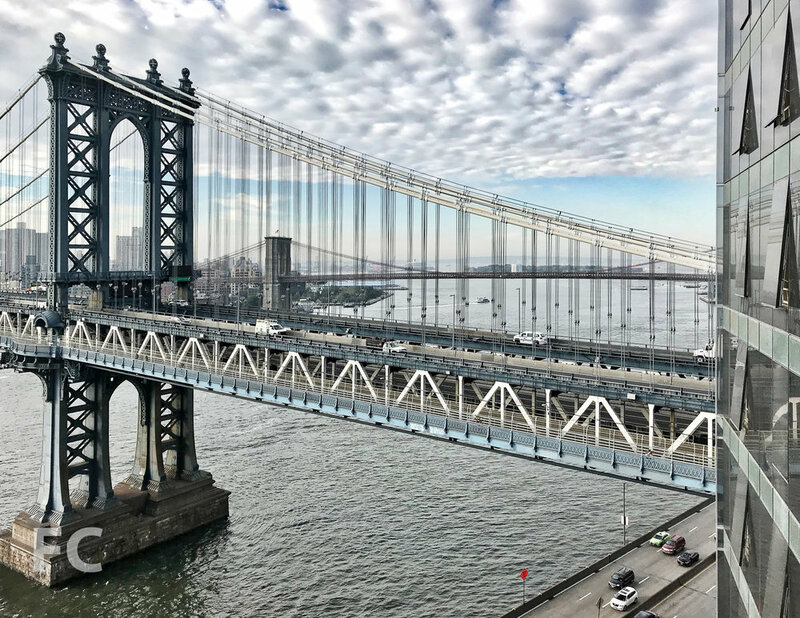 The city has undertaken a multi-year project to upgrade the East River Esplanade, Pier 17 is undergoing a major retail reconstruction, and construction of residential towers are following. One Manhattan Square is at the forefront of residential development in this neighborhood, with towers by SHoP Architects and Handel Architects also proposed at adjacent waterfront sites. Southwest corner of the tower (left) and the Manhattan Bridge (right) from the East River. Design of the exterior curtain wall of the tower includes two different wall types. At the north and south facades, panels are floor to ceiling glass with a bronze metal spandrel at the floor slab. For the east and west facades, flat glass panels are alternated with panels that tilt outward from the floor or the ceiling, adding dimension to the façade and a more dynamic reflection to the glass. Northwest corner of the site from Cherry Street. Looking up at the northeast corner of the tower from Cherry Street. The north façade of the podium from Cherry Street. Close-up of the west façade. The tower will offer 815 residential condo units designed by Meyer Davis with luxury finishes and top of the line appliances from Miele and Subzero. A choice between dark and light kitchen finish packages will be offered to residents for customization of the residence to their tastes. 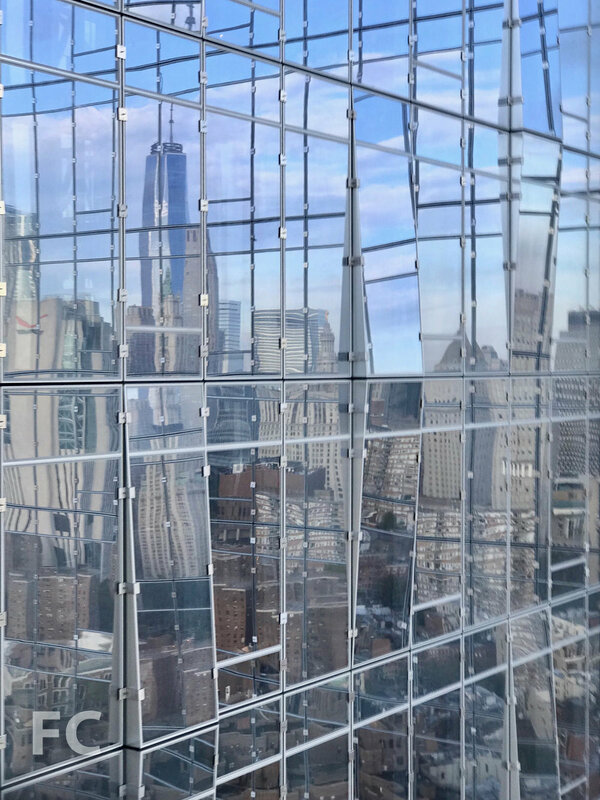 Views from the tower, even at its current height, are panoramic, affording views of New York's iconic architecture and waterfront from Lower Manhattan to Midtown to Brooklyn. View west towards the Financial District from the 58th floor. View southwest towards Brooklyn Bridge Park and Brooklyn Heights from the 58th floor. 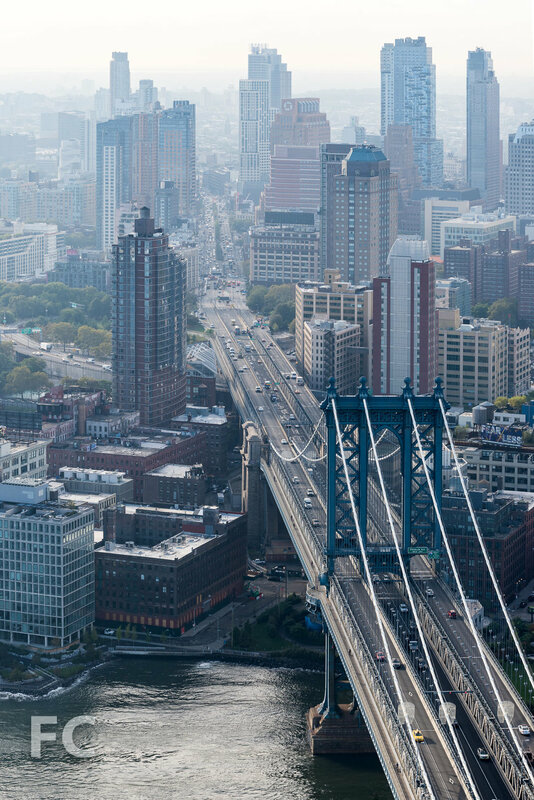 View south towards Downtown Brooklyn and the Manhattan Bridge from the 58th floor. View south towards the Brooklyn waterfront from the 58th floor. View northeast towards Williamsburg and the Williamsburg Bridge from the 58th floor. View north towards Midtown from the 58th floor. Residents will have access to over 100,000 square feet of indoor and outdoor amenities such as a sports club, spa, entertainment and recreation facilities, and high-end services. Outdoor amenity spaces are designed by West 8, the team behind the ongoing redevelopment of Governors Island, which is visible from the waterfront views in the tower. Completion is expected in the second half of 2018. Architect: Adamson Associates; Interiors: Meyer Davis; Landscape Architect: West 8; Developer: Extell Development Company; Program: Residential; Location: Lower East Side, New York, NY; Completion: 2018.